**Happy Father’s Day to all you dad’s out there! I am blessed with an amazing father, an amazing father-in-law and an amazing father to my child. I am one lucky lady to be surrounded by wonderful men!!! I hope you all enjoy your day! **So because it’s Father’s Day, does that mean my 15 month old gets to get up at 5am while my hubby sleeps? 😉 Yes, my child has been getting up WAY to early!!! We have tried everything from pushing bedtime back to let him just hang out and cry. However, today I did let him cry for about 10 minutes and he FINALLY laid down, found a paci and went back to sleep!!! WOOHOO!! BUT, could I fall back asleep? Nope!!! **We won a tri-family membership to three awesome places in the Des Moines area last Christmas. One of those is the zoo. We have been three times in the last three weeks or so! It’s great, we get in for free and Grayson LOVES it. It’s the perfect size for anyone under the age of 10. When our pass expires I think we will end up for sure getting at least a year membership to the zoo. **Curt and I went out to a movie last night. it was the first time since seeing Catching Fire in December!! WHAT?! We went to see Neighbors. It wasn’t bad, I give it 3 out of 5 stars and Curt gave it 2.5. If you are new parents or parents to little ones I think you would find it relate-able and funny. Otherwise, I wouldn’t recommend it. **We are almost done with our kitchen reno!! Curt just needs to put some minor touches together and I need to finish an item or too and I will share pictures. It turned out amazing and I can credit ALL of it to my awesome hubby! 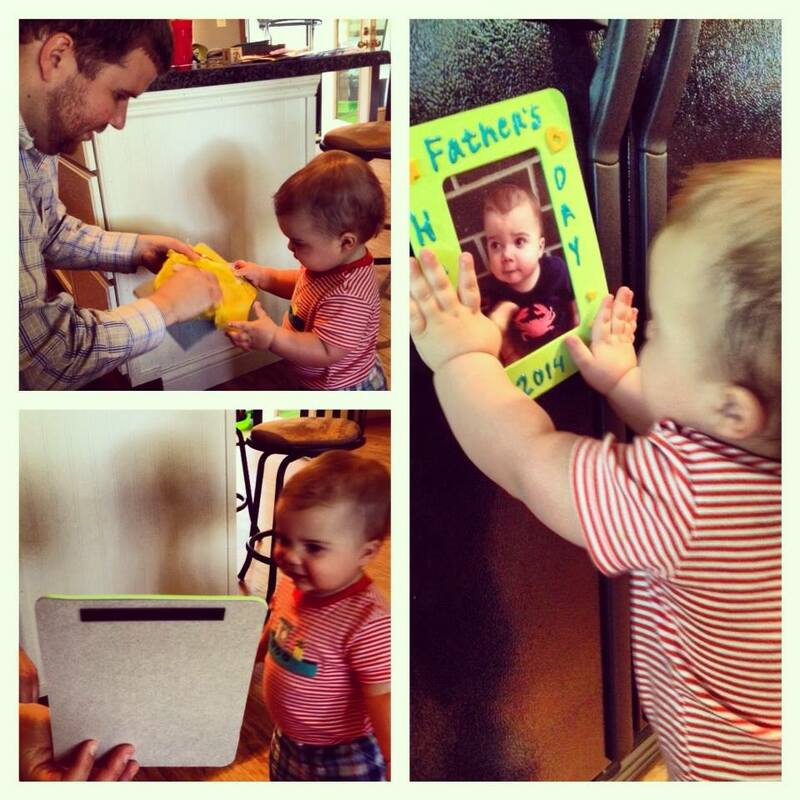 **Grayson made the cutest gift for Curt for Father’s Day at daycare. It’s a cute picture frame with the CUTEST photo of him and a cute little card. Grayson was so proud to show it to his dad (see below). So glad my daycare is so awesome with stuff like that. **I feel like I had some mom fails this week in regards to Father’s Day. I tried to make a garden stone for Curt with Grayson…that was a DISASTER. Between Grayson dumping 4 cups of water on our treadmill to him trying to grab the cement stuff before it was ready to dumping it in the yard. It didn’t pan out. Then I tried to make french toast this morning (usually Curt makes it) and one of Curt’s wasn’t fully cooked! AHHH!! Good thing I have a loving and understanding husband. 😉 I’ll stick to pancakes….and we will re-do the garden stone today as a family. That’s our plan! Whatever you and do I hope you all have a wonderful day! !